One of the major concerns of Canadians holding US real estate or other assets is whether the property will be subject to the US estate tax when they die. It’s no small matter. The estate tax top rate is 40%, and unlike Americans, foreign nationals who own US assets generally only qualify for a paltry $60,000 estate tax exclusion amount, not the current (2018) $11.2 million unified credit available to American citizens. Theoretically, if no planning were done and a foreign national died with a US vacation home worth $1 million, his estate would owe about $322,000 in US estate taxes. Just as important, while American citizens have the benefit of the unlimited marital deduction when they leave their estate to a spouse (which is the typical estate plan), noncitizen couples cannot make use of the marital deduction to reduce or eliminate US estate taxes (unless they establish a QDOT, discussed below). Fortunately for most Canadians, however, the US-Canada Tax Convention and its protocols, come to the rescue, if they plan right. Here’s how. For US citizens with assets over the approximate $11.2 million estate tax threshold (as of 2018), the unlimited marital deduction can be the most powerful weapon in the estate planning arsenal. The concept is simple. If you leave assets to your spouse at death, the value of the testamentary gifts is deducted from the gross estate subject to the tax. What follows from this is that if you leave all your assets to your spouse, there is no estate tax due at all. That’s the “unlimited” part. To take the extreme example, Bill Gates can leave his wife his entire fortune of $90 billion or so, and his estate won’t owe a penny of estate tax. The estate tax is zeroed out. There are some complexities, like what constitutes a completed gift for purposes of the deduction, and how does Bill make sure Melinda doesn’t marry a gigolo and leave his children nothing. That’s why estate planning vehicles like the QTIP trust were invented. But essentially the unlimited marital deduction allows married US citizens to leave their assets tax-free to their spouses. Foreign nationals are not so lucky. One of the requirements of the unlimited marital deduction is that the spouse who inherits the property must be a United States citizen. Noncitizen married couples generally don’t get any estate tax protection by leaving assets to the surviving spouse. The traditional way around this is to create a “qualified domestic trust” (QDOT) to hold the US property. But QDOTs come with their own particular burdens, among them being the tax is not eliminated, but merely deferred until the death of the surviving spouse. Canadians, however, benefit from the favorable provisions of the US-Canada tax treaty. 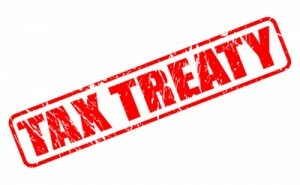 Working in tandem with a prorated $11.2 million unified credit (another special benefit conferred by the treaty on Canadians not available to most other foreign nationals), the tax treaty allows an estate tax credit for transfers to a surviving spouse equal to the lesser of (a) the estate tax on the portion of the credit that is utilized, or (b) the estate tax otherwise payable on the property transferred to the spouse. This so-called “marital credit” effectively doubles the US estate tax exemption Canadians can benefit from to a maximum amount of about $22.4 million. It means that married Canadians whose estate plans provide for transferring their US assets to the surviving spouse at death, should be able to avoid paying US estate taxes even if their estate were made up entirely of US assets worth $22.4 million. For Canadians to get the benefit of the marital credit, some estate planning is required. The credit is available to testamentary plans that would qualify for the marital deduction if the surviving spouse were an American citizen. That can be as simple as a will with an outright gift to a spouse. But here estate planning for tax purposes comes up against other considerations, such as avoiding probate. Most Canadians use wills for their Canadian assets, but US real property requires a separate ancillary probate in the US if disposed of by a Canadian will. A simple revocable trust holding only US real property is usually the preferred estate planning tool for Canadians to avoid this problem. However, such a trust usually won’t qualify for the marital credit. A QTIP can be used, but it’s a cumbersome vehicle for a single asset, which in most cases isn’t a significant part of a Canadian’s estate plan. And, because it’s usually just a vacation home, Canadians don’t have the Melinda Gates-gigolo problem. Therefore, for the assets in a simple revocable US real estate trust to qualify for the marital credit, special drafting is required by an attorney who understands both the marital deduction under US estate tax law and the marital credit under the tax treaty. In all but the largest estates, the marital credit for Canadians with US assets obviates the need for a QDOT. And it is important to note that if the tax treaty marital credit is elected, the QDOT marital deduction is not available, even if an otherwise qualifying trust is created. The estate fiduciary must choose one or the other. Indeed, using a QDOT in most cases will burden the surviving spouse with unnecessary expenses (like the need to have a US bank as cotrustee for a trust corpus over $2 million) and may actually result in higher taxes in the aggregate. It’s important, therefore, not to jump to the QDOT conclusion, which many traditional estate planners do if they are unfamiliar with the US-Canada tax treaty. Rather, the first step is a careful analysis of the overall tax and administrative burdens of a QDOT versus a simple revocable trust with marital credit provisions under the tax treaty. Most foreign nationals don’t have a choice if they want the marital deduction. Canadians do. Manes Law offers world class expertise in estate planning and probates for international clients who own US assets, with an emphasis on Canadians owning vacation homes. Manes Law is a leader in cross-border trusts for Canadians & foreign nationals. Learn more at our website: www.calresidencytaxattorney.com. Follow us on Facebook and Twitter.